You hope for a significant change in the political climate in Australia, Tony Kevin? As Samuel Johnson (I think) said of second marriage: that would be the triumph of hope over experience. I utterly acclaim the tremendously dauntless stand Mr. Abbott took on gay marriage, [part of the platform upon which he was elected]; and, his readiness to take the issue to the people; no doubt assured of their ratification. And yet Marg, there are many second marriages of which it could be said that they are the triumph of experience over ignorance. This is no triumph. `Greater civil discourse and intellectual integrity`? Time will tell. There is nothing in this or any other coup which helps promote the things conspirators convince themselves justify their actions. Make no mistake - this was a coup made thinkable by the dangerous precedent set by Gillard over against Rudd. We are fortunate these were bloodless...without guns and military involvement. Selfish, deluded politicians who pursue personal advancement under the guise of `best interests of the country/party` whatever it may be, live by deceit and subterfuge and will die by it. This is a disaster for stable, mature, wise government. And the Opposition is in no position to comment. These are concerning times for principled democracy in Australia.
" We can look forward to a real return to greater civil discourse and intellectual integrity in politics." Hopefully. When one group fights another, each seeking to advance their own interests, strife results. \when all cooperate for the common good, 'a fair go for all', all benefit. It is the pagans of this world who set their hearts on being one up. 'Set your hearts on the kingdom of God, and all else will be given to you as well.' Peace, Harmony and Happiness. I am really glad to see the back of Mr Abbott and wish Mr Turnbull well. Hopefully we are in for a less pugilistic time with effective and mature policy for the good of the whole community rather than a mix of the street-fighter`s aggressiveness, negativity and right-wing prejudices. thanks for comments. my essay enjoyed good company on this topic with the two andrews. i especially enjoyed Roy Fantholme's crisp summation. Maybe now Police in all States and Territories will be in a position to execute those outstanding arrest warrants on Abbott for repeatedly impersonating tradesmen over the past two and more years. Fionna Winn’s comments are well made. Whilst the Gillard knifing of Rudd set a precedent, it was not a good one. If anything, it was something that should not have been repeated. Alas, it has. All this call for politicians to set aside selfish interests and place the greater public good ahead of it sounds hollow and naive, considering that what we have just seen is a prime example of selfishness coming to the fore. What we saw demonstrated on Monday is that when it matters, loyalty is not a prized virtue. 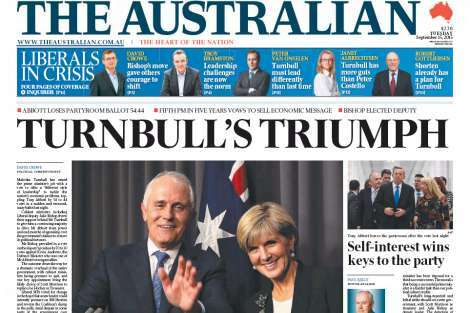 Regardless of how the apologists for the coup may rationalise the ousting of Abbott, there is no denying that those 55 Liberals who voted to oust Abbott did not consider that loyalty was important. Loyalty is a matter of moral choice. Self preservation is driven by instinct. Clearly, those 55 Liberals found the dictates of instinct more compelling. Those who get their knickers in a knot over the 'knifing' of leaders 'elected by the people' miss two important points. In a parliamentary system like ours, (1) the PM is elected by her/his parliamentary party, not by the people, and (2) the PM only leads with the consent of the led. Once that consent is withdrawn, s/he is no longer the leader. Ours is not a presidential system like that in the US. Yes! The civility may improve but let's not take policy change on face value! Turnbull is wedged by his own party already on climate, budget, and education policy ie Gonski, not Universities> I fear we are so relieved we won't see the danger!